Remember awhile ago I blogged about Etude House foundation called Precious Mineral Any Cushion? If you would like to check it out, it is <<this post>>. 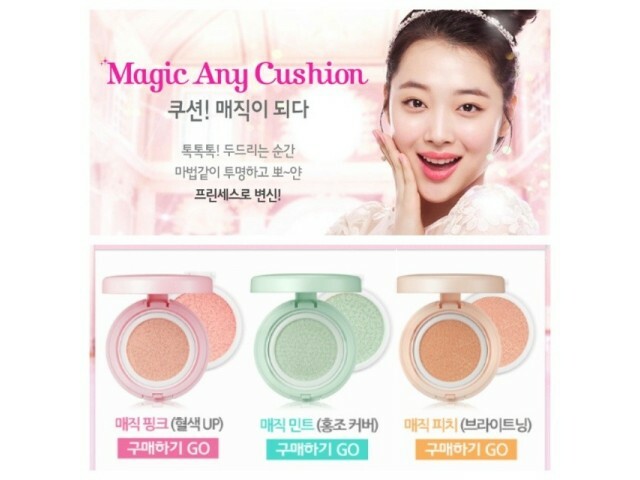 Recently, Etude House launched a new makeup base called Precious Mineral Magic Any Cushion to complement the foundation. It is a makeup base/foundation base to be worn underneath your makeup or you can wear it on its own. It comes with 3 different version for different effect. Magic Pink - To smooth out pale skin into healthy and vibrant skin. Magic Mint - To hide blemish and minimize redness into toned up smooth skin. Magic Peach - To brighten up dull skin into natural, toned up skin. The one I have is in Magic Mint. The product comes in a compact form just like the Any Cushion foundation. Retrieve the product from the compact with the sponge provided, pat it onto your forehead, nose area, cheek and chin, then smooth it out just like how you would do with compact foundation. If you're going for a natural finish, apply it on top of your moisturizer. For a better coverage, use it as a foundation base. It has a very sheer coverage and the texture is dewy. 1. It corrects your skin tone and prep your face prior to putting on your makeup. 2. It is made from mother pearl extract and albutin which gives a whitening effect. 3. It gives a natural finish. 4. It comes with SPF34 and PA++ which can be worn as a base if your foundation lack of sun protection. 5. It is a multi-use product. To achieve the Korean beauty flawless toned up look, use the Magic Any Cushion with the Any Cushion foundation. It gives a refined natural coverage with a glow on your face. In my utmost honest opinion, I think this can be a confusing product. There's nothing in this product that mention it is for base, and then to add more confusion, you can actually wear this on its own. I find it a bit hard to fit this product in a specific category. As a base, I would prefer one product that does it all. However, the Magic Any Cushion comes in three different version for you to choose. It adds a little bit of my confusion there. What if I want all the benefits from the three products? Don't get me wrong. The product is fine by itself and it really works. It will prep your skin into a flawless canvas before you put on your next makeup product. If you're going for the dewy and glowy look like most Korean actress, this product is the one you might want to invest in. The only downside of the product is the expensive price tag. Other than that, it is good to have this. Price: RM119.90, available at all Etude House outlet. P/S: I meant to post this up earlier, but I lost my product. I only use this for less than 5 times. This is why you didn't see any photo of the swatch and my usual selfie using the product. However, I will look for it and update photo of the swatch soon.